There has been a good deal of talk recently about the public value of unions, much of it framed in the euphemistic language of “right to work” laws and the alleged unfairness of “collective bargaining.” There is probably something to be said about how unions have occasionally exploited the power of collective bargaining in ways that may not always be in the public interest, but as Hariman pointed out recently, corporations are no less collective bargaining agents representing the special interests of owners and shareholders. And so it hardly seems reasonable to single out unions as singularly or generically problematic in this regard. But since we are approaching the 100th anniversary of the Triangle Shirtwaist Factory Fire, there might be a different point worth making. The Triangle Shirtwaist Factory (TSF) was on the 8th-10th floors of the Asch Building near Manhattan’s Washington Square. The TSF was what we would today call a sweatshop and the working conditions were oppressive. The vast majority of the 500 employees were teenage girls, most of them recent immigrants who spoke little or no English. At 4:45 p.m. on March 25th, just short of quitting time, a fire broke out and spread quickly. There were two descending stairwells, but one was quickly blocked by flames and the second was locked to avoid theft. Some packed themselves onto the sole working fire escape which quickly collapsed under the extreme weight (and in any case apparently led nowhere), others jumped down an elevator shaft or made their way to the roof of the building only to jump to their death 135 feet below. When all was said and done 148 people—129 women and 19 men—were dead. The owners were indicted on charges of manslaughter, but subsequently acquitted. Two years later they lost a civil suit which compensated each family $75.00 for the loss of their loved one. The owners were compensated by their insurance company in excess of their reported losses and in the amount of $400 per death. 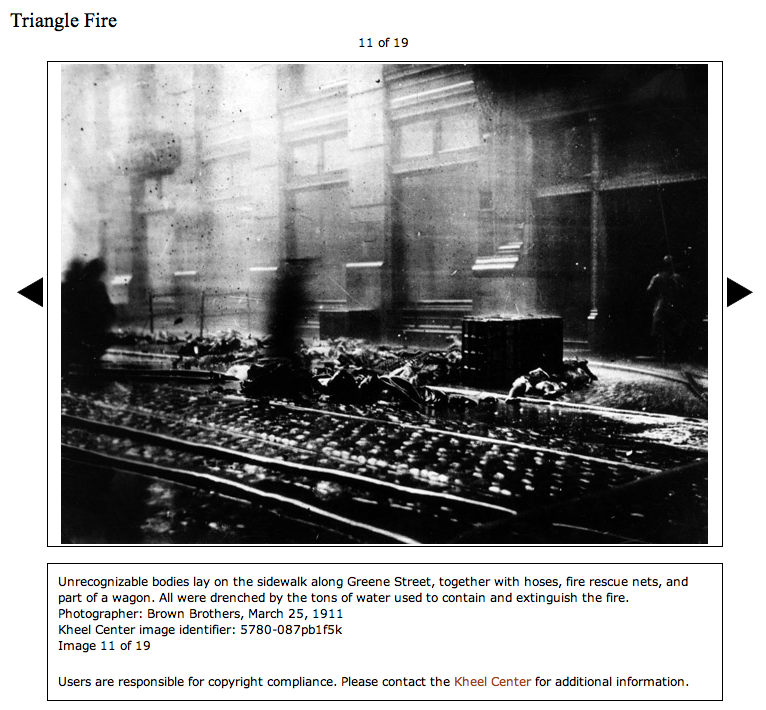 The final cause of the fire was never determined, but what the photographic record made palpably clear (here, here, and here) was that the health and safety conditions of the TSF were wholly inadequate. And this was doubly tragic since groups like the International Ladies Garment Workers Union and the Women’s Trade Union League had been advocating for better working conditions and protective safety legislation for several years. Following this tragedy they redoubled their efforts in both lobbying for reforms and monitoring the safety conditions within the garment industry. Things did not change immediately, as industry leaders continued to argue that stringent safety codes would wipe them out of business—an argument that seems to persist in contemporary times—but it is hard to imagine that without the efforts of union organizations that things would have changed very much … or at all. 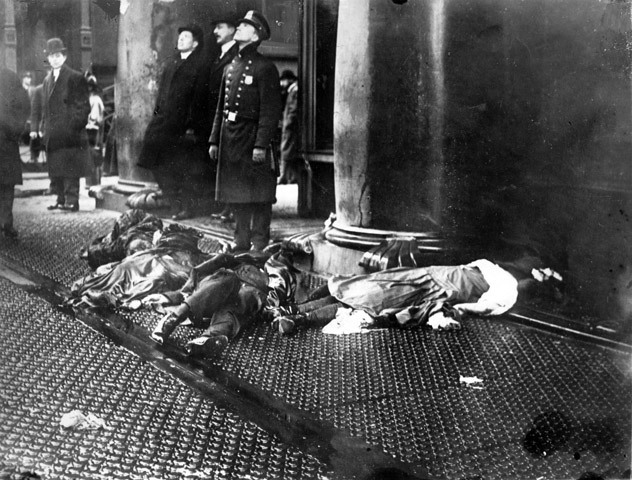 As we debate the value of unions in the days and weeks ahead we are well advised to recall the Triangle Shirtwaist Factory Fire and the need that workers have for a collective voice in representing their interests, particularly in the face of efforts to castigate unions as little more than selfish, greedy operations. And to the extent that any of that interest speaks to questions of health and safety we need to recognize the especially important watchdog, public interest that is being served. 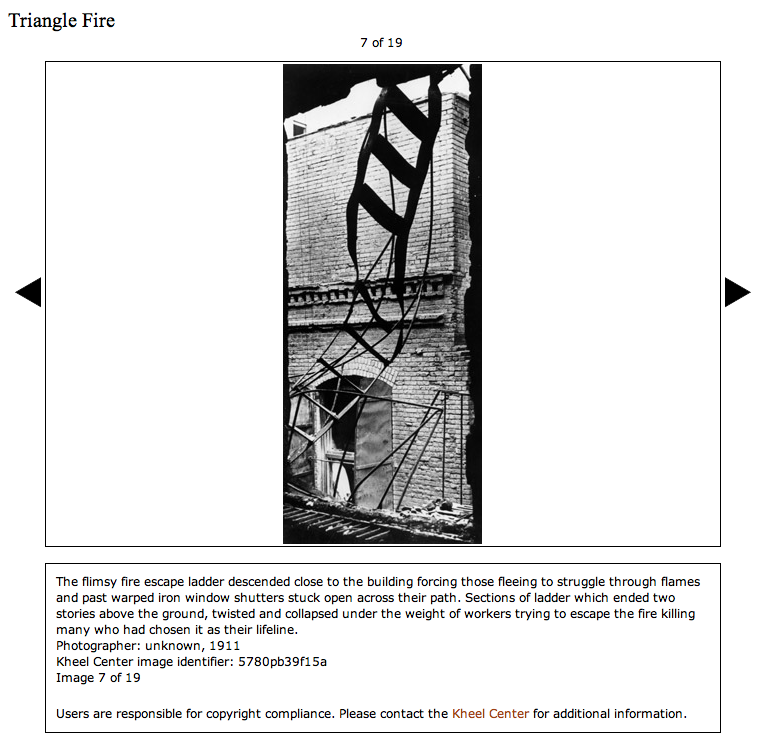 Update: The NYT “City Room” is remembering the Triangle Shirtwaist Fire this week. Thanks to NCN friend Jim Johnson for bringing this to our attention. It turns out that contra Sontag, photography did not just grow up hand in had with war, it grew up hand in had with democracy too. My Grandfather was a UMW “Organizer”, one of John L. Lewis’ “inner-circle” and even named his son (my Uncle) “John L.” after him. Unions were necessary in 1930’s Coal-Mines – and probably in 1911’s garment factories as well. This isn’t 1911. Further, I FIRMLY believe that if Old-Pop were alive today, he’d hate most of them as much as I do. I spent several years working in a UAW auto-plant, and several more in a .gov agency. It is a toss-up which was worse – both were utterly unconscionable, and I left both jobs for my own mental-health because I could no longer stomach what I witnessed every day. In sum, “WASTE, FRAUD, THEFT AND ABUSE” – endemic, constant and institutionalized. I witnessed auto-workers DELIBERATELY installing wrong parts so others could get paid OT to fix the mistakes. We implemented a system to prevent these mistakes but they INCREASED – with the accusation that “the system doesn’t work.” We placed a hidden camera – so we could WATCH – and recorded constant and DELIBERATE “mistakes” – and had a “grievance” filed against us as a result — the perps were never disciplined. I – and others – watched them deliberately destroying wireless-antennas to cripple another system that streamlined delivery of parts to the plant floor — and eliminated 2 “union jobs” in the process. Nobody was ever punished. I could – literally – write a book of what I saw — and the .gov workers were even worse. In a “private” setting, if the owner does not want to deal with the union he can close the plant. In GOVERNMENT, the owners (We The People) do not have that option. This is why “public sector unions” are unethical – and no other reason need even be named – but I’ll add one more: Today it’s nothing more than a quid-pro-quo. Unions elect Demmunist politicians who then shower favors (*MY* MONEY!) on them as payback. Even without such graft, the Unions’ pet politicians are then – supposedly – to represent We The People at “the bargaining table”? The conflict-of-interest is obvious — if any of US ran our business this way the SEC would put us in prison. It’s really quite simple: take what We The People offer, or find another job! Not 10% of the union-workers I ever saw would last a week in the average non-union business – they’d be fired, and rightly so. You DO NOT have the right to exercise extortion-tactics when you’re working for We The People. Cops and firefighters especially — no person can serve tw0 masters, and thus cannot be loyal to both the union and We The People. Unions’ days are numbered — there are millions who would love to have your job if you don’t want it. The REAL reason they’re all so upset is that they’re about to lose their ticket on the gravy-train – and most of the rest of us KNOW IT! Show me a modern-day sweatshop ANYWHERE in the US. The Unions no longer protect the workers from greedy employers – they protect the lazy, the incompetent, the crooked and evil from getting their just desserts. I know – I’ watched it every day for YEARS. Jim: Thanks for checking in. And for the link to the Times article. I missed that, but it is a good piece. And yes, for all she provided, Sontag missed quite a bit. In that regard, have you seen Susie Linton’s The Cruel Radiance? It too makes an important argument in this regard. I always supported unions–until I was virtually forced to join one. I worked at an employer where the union gained the “right” to extract union dues from an increasing number of positions; that was this white collar/clerical/office worker union’s goal and purpose. Whether you joined or not, if your “position” was a unionized one, you paid dues. This union constantly actioned for longer vacations, more positions on their rosters, and lower premiums on health benefits. Their bargaining rights for access to the middle class did not interest me, but I had little choice. Despite this negative experience, I believe in unions. I just hope that the option to join or not join is always available. Don’t stand too close to the entitled, greedy unions–you may get sucked in. They have given labor unions a bad name.